A celebration to mark 50 years of one of the UK’s most iconic bands tops the latest tranche of artists to be added to the line-up. Jethro Tull’s legendary guitarist Martin Barre will bring his new show with former band members Dee Palmer and Clive Bunker to the festival. Other new announcements include an exclusive UK festival performance from American activist and musician Rev. Seckou; Irish band Jiggy whose video Silent Place took the internet by storm clocking up more than 30m views; Cajun Country Revival which hails from Louisiana, USA, with special guest Vera van Heeringen; American alt-country blues musician Amythyst Kiah; blues and world music trio Michael Messer’s Mitra; and the return of Jim Moray’s Kingstone Press Folk Slam as the traditional finale on the festival’s Pengwern stage. Already revealed are a host of top folk, roots and singer songwriters including Andy Fairweather Low and the Low Riders with the Hi Riders Soul Revue, Oysterband, Kate Rusby, Capercaillie, Martyn Joseph, Skerryvore, Daphne’s Flight, American trio Birds of Chicago, Gary Stewart’s Graceland, Phil Beer Band, Steve Knightley, Merry Hell, Edgelarks, Grace Petrie, Urban Folk Quartet and many more. There will also be a special day of programming on the Pengwern Stage by duo Chris While and Julie Matthews to celebrate 25 years of their musical partnership. They have chosen Blair Dunlop, Burden of Paradise, singer songwriter Charlie Dore and former Fairground Attraction lead singer Eddi Reader and another act to be announced to perform on Sunday August 25, which will be topped off with a show by the While & Matthews Big Band. Weekend tickets are already selling at our third tier price and only a handful of Saturday and Sunday day tickets remain. Friday and Monday tickets are also available. Director Sandra Surtees said: “We are over the moon to be hosting Martin Barre’s special celebration of 50 years of Jethro Tull as it’s a band that spans generations and genres and will be the most incredible show. “We always look to bring a diverse mix of music to the festival and we’ve developed a reputation in recent years for programming some of the most exciting Americana and world music alongside traditional folk. This year is no different with the new headliners we’ve just announced. For more about the line-up click here. Tickets have gone on sale for the 2019 Shrewsbury Folk Festival as we’ve shared the first names to be added to the bill. Festival Director Sandra Surtees: “As ever the Shrewsbury line-up will feature some of the biggest names in folk, some popular performers that have been requested by our audience and a number of world and Americana acts. Visitors to this year’s Shrewsbury Folk Festival have helped to raise a record amount for its long-term charity partner. Hope House, which supports children with life limiting illnesses and their families, received more than £7,000 from this year’s four-day event, including a donation of more than £2,000 from festival organisers. The money will be used to fund music therapy sessions at the hospice. More than £63,000 has been raised in the partnership between the festival and Hope House since they established it 10 years ago. This year the Hope House stall at the festival raised more than £2,500 and the annual collection at two of the main stages resulted in around £1,750. Money was also raised through the charging of mobile phone and other electrical devices as well as other collecting tins around the festival site. Festival Director Sandra Surtees said: “We make a donation for every adult weekend ticket that is sold but it is down to our amazing supporters who every year continue to give a very public show of support for the work the hospice does. This year they have surpassed themselves! Vanessa Thomas, the Major Gifts Manager for Hope House, said: “We are so thrilled to continue our partnership with the festival. It is such an incredible event that we are never short of volunteers to come along and man our stall or shake our collection buckets! The 2019 festival will be held at the West Midland Showground in Berwick Road from August 23 to 26. The first headliners will be revealed on December 1 when tickets go on sale at www.shrewsburyfolkfestival.co.uk. Folk legend Richard Thompson is set to make an electrifying return to this year’s festival with a rare appearance with his Electric Trio. The former Fairport Convention musician, named by Rolling Stone magazine as one of the top 100 guitarists of all time, will headline the Bellstone stage on Saturday August 25. Other names added to the programme include the new duo of Peter Knight (ex Steeleye Span) and John Spiers (Bellowhead) and singer songwriters James Riley and Edwina Hayes. 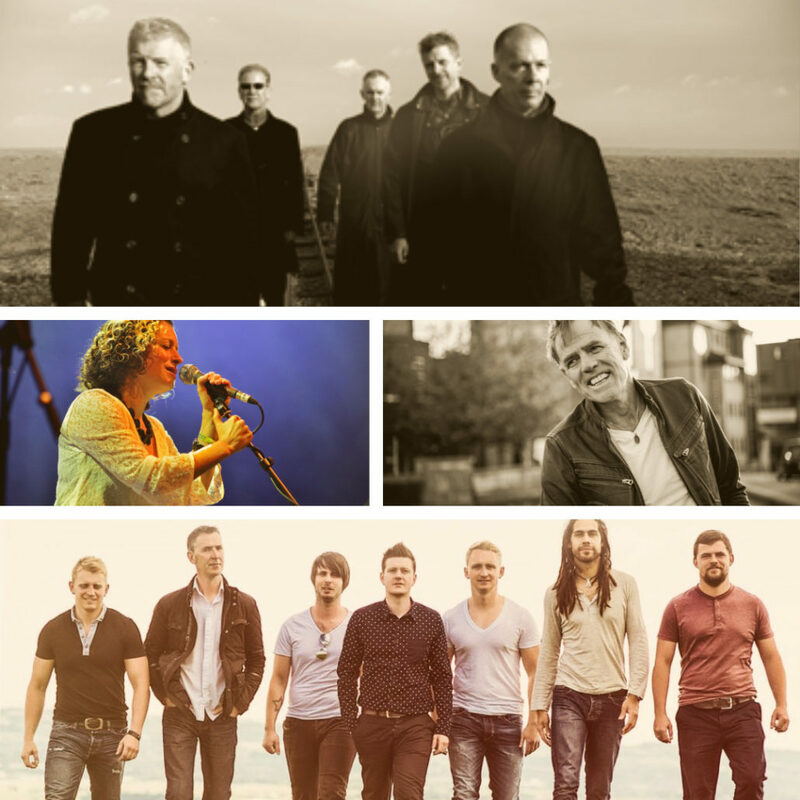 Already announced are American singer songwriter Gretchen Peters, Steeleye Span, Irish super group Usher’s Island, Show of Hands, Jon Boden and The Remnant Kings, Gigspanner, BBC Folk Award winner Daoirí Farrell and Scottish folk rockers Skerryvore. Chinese flautist Guo Yue and Japanese drummer Joji Hirota will reunite for the festival with the London Taiko Drummers and Canadian band The Fitzgeralds – one of the hit groups of last year’s festival – will also make a welcome return. Other performers include Welsh indie roots band Rusty Shackle, State of the Union – the duo of Boo Hewerdine and Brooks Williams, O’Hooley & Tidow, Megson, Blowzabella, Banter, Alden, Patterson & Dashwood, The Rogues Shanty Crew, Emma Morton & The Graces, Midnight Skyracer, FOS Brothers, Inlay, and Foreign Affairs. Dance bands will be Blowzabella, Bedlam, Committee Band, Vertical Expression, Kirkophany and Out of Hand. More than half of adult weekend tickets have already been sold with more than six months to go! Director Sandra Surtees said: “We are delighted to have secured this rare appearance by the Richard Thompson Electric Trio for Shrewsbury. Richard is a folk legend but he doesn’t often perform in this format so it’ll be a real treat for our audience. “The line up contains a wide variety of traditional and contemporary folk alongside singer songwriters and north American and Canadian acts so there is something to appeal to all tastes. Weekend and day tickets are now on sale and can be booked at www.shrewsburyfolkfestival.co.uk. A CD launched in tribute to our co-founder Alan Surtees has raised more than £4,000 for a charity set up in his name to support young and emerging musicians. The profits from Resound, a 15-track recording featuring tracks from artists including Oysterband, Jon Boden, Grace Petrie and Karine Polwart, will be ploughed into the Alan Surtees Trust. The Trust, which has been formed by musician and clog dancer Hannah James, aims to open applications for its first grants next Spring. Trustees involved in the charity include Alan’s wife Sandra, with whom he co-founded the festival in 1997. Hannah came up with the idea for the trust following Alan’s death from cancer in June. She said: “As someone who has benefitted from the generosity of Shrewsbury Folk Festival, I want to take the baton and keep some of this support and momentum going. It seems like a very fitting way to serve Alan’s memory. More than 500 CDs were snapped up in exchange for donations at this year’s festival and it is now available to buy online at Fish Records. A fundraising gig is being planned for February 2018 to raise additional funds with the first round of applications for grants opening in March. Further fundraising will be organised in future years to support the charity’s ongoing activities. To buy a CD direct, go to: www.fishrecords.co.uk. Thank you so much for all your amazing fundraising efforts for Hope House at this year’s festival. 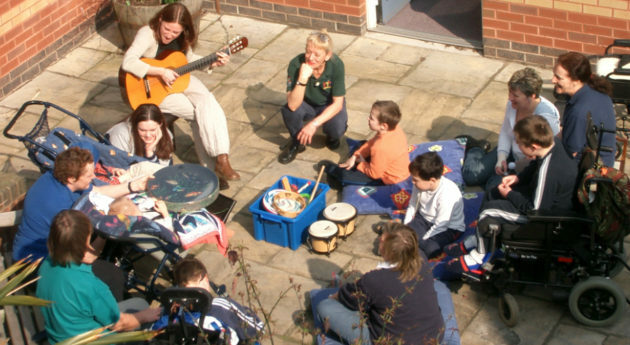 You’ve helped to raise more than £6,400 for music therapy sessions for the children with life limiting illnesses that use the hospice. This year’s fundraising takes the overall amount pledged to Hope House since we began our partnership in 2008 to more than £56,000!!! The money is raised through collections on Sunday afternoon, the fee for charging mobile phones and other electrical items, the Hope House stall on site and a donation from us for every adult weekend ticket that is sold. For more about the hospice and its great work, click here. And in at number one…..